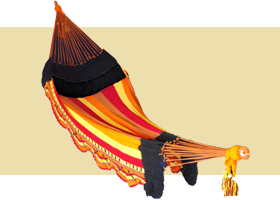 Ever since we opened our online hammock shop we’ve aimed to be different. From the beginning we focused on boldly designed, colorful hammocks and tried to convey the adventurous and rebellious appeal that one feels when travelling in Central America. Why? Because we want to make a change. We want our hammocks to inspire the same sense of adventure and wonder we felt when we first discovered them travelling through Nicaragua. It was always interesting to us that you could just as easily take a nap in a bed, but there was something exotic, or even mysterious about a hammock. And maybe part of that is where the hammocks are made. Mexico, Nicaragua, and the whole Latin American region around them is seen as a distant, often dangerous, and always-mysterious outlaw landscape where anything can happen. These are the countries where dictators fall at the hands of revolutionaries and outlaws run from the authorities in heroic fashion. It’s nothing if not interesting. And we want our hammocks to be the same. Hammocks don’t have to be relegated to the beach or backyard. And they don’t have to be uncomfortable, boring white fishnet looking things that never get used. They can be different. They can be better. Life is too short for boring hammocks and boring companies. Central America is a colorful place. Which is why we sell colorful hammocks. Because plain white is just too damn boring.